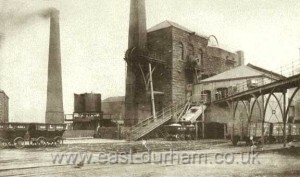 Seaham Colliery High Pit, circa 1900. Labour is an underlying topic in Adeline Hodges’ memoir as, though it is not mentioned constantly throughout the text, it is definitely deemed an important factor in her childhood and later life. Though Adeline mainly focuses on the happier and idyllic memories of her early years in Dawdon we see hints of hardship in her father’s career as a ‘Stone man down the pit’ and how the family would have struggled had he not worked long and tiring hours to support them. Adeline notes that, ‘when very young the only crisis in our life was when father was ill and couldn’t work’. She tells us how she used to ‘listen to the caller’ to see if her father was working that day, she writes, ”and mechanics’ was the vital part for my father because if the caller stopped at wastemen my father would work, but if he added the dread words ‘and mechanics’ my father would lose a shift’. The word ‘dread’ emphasises the importance of her father’s ability to work hard and be the breadwinner for the family, we see this shown again here as she writes, ‘Maintenance men had no respite and men like my father only had a Saturday. Mind you they could be sent for at any time of the day or night for an extra shift, which was always reckoned a ‘god send”. But even at death miners could joke. They had a very keen sense of humour, so many of their pals met with fatal accidents in those days that they must have developed this humour to protect themselves. The powers that be at the collieries showed no respect. It seemed to be considered one of those things. There was a fine old man lived in the next street to us. He had a tall military bearing, snow white hair but a black face. We were told that he had been in the Nack explosion and his face had caught the blast. This had been the second explosion within a few years. Mining was a dangerous job in those days and when we went to bed we were taught to pray for them. The terrible reality of the dangers that her father faced at work, and the exploitation of the miners by the collieries is contrasted in Adeline’s memoir with accounts of the loyalty and solidarity of the mining community. She describes how the miners were placed in teams called ‘marras’ and these would be their close work colleagues for a long period of time. She writes, ‘The miners have always been a loyal bunch of men. Mind you, some of them were more loyal to each other than they were to their own wives. My father used to tell many stories of the loyalty a miner bore to his ‘marra’, but mother questioned it many a time’. Adeline also writes, ‘When father was bedfast in his later years a miner friend used always to call with a flower from his garden, preferably a rose and father would have it as a buttonhole in his shirt’. This stress on the significance of the friendships and bonds between the miners is touching and also shows how working as a miner created a sense of social identity. 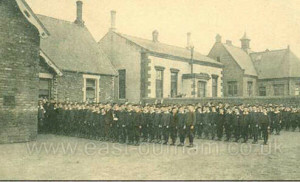 Seaham High Colliery Boys’ School, date unknown. Jane Humphries writes, ‘another key finding from the autobiographical evidence is that children were the most important secondary earners in working-class families through the period of the industrial revolution and on until the middle of the nineteenth century. They shared the burden of breadwinning with fathers, provided resources for hard-pressed mothers, and helped to support dependent siblings’ (2006, page 5). When Adeline is 16 she becomes a ‘pupil teacher’ and receives ‘the magnificent wage of sixteen shillings a month’. This income is one to be proud of, as she explains that girls who went into service would be ‘lucky to receive three shillings a week for doing all the work’. Humphries’ findings can be applied to Adeline’s memoir, as her wages go towards supporting the family. We see this as Adeline explains that she was unhappy at her first real (not training) teaching job at Seaham High Colliery Boys’ School. She writes, ‘I was far from happy and begged mother to let me leave and go into service, but as I was then the eldest left at home with five more children younger, she persuaded me to stick it a little longer, you see, I had twenty-five shillings a week, and mother was depending on this’. Here Adeline acknowledges her mother’s reliance on her income as a teacher. She later writes about how her brother’s wages also helped, ‘My brothers were growing up and one after another started work. Wages were very small but one with another made it easier for mother’. As well as working to help support her family, Adeline grows to love her career as a teacher and has a passion for it, she writes, ‘My first class of fourteen year olds consisted of fifty seven boys; I can truthfully say it was one of the most satisfying years of my life. I put everything I could into my work and I love the boys who were very respectful towards me. I have taught many of their grandchildren since then’. As I mentioned earlier, careers and labour are not central to the memoir but they intertwine with daily life and allow Adeline’s family to live contently as well as presenting opportunities to form social bonds within society and the community. Bronstein, Jamie L. Caught in the Machinery: Workplace Accidents and Injured Workers in Nineteenth-Century Britain. Stanford: Stanford University Press, 2008. Humphries, Jane. ‘”Because They Are Too Menny…’ Children, Mothers and Fertility Decline: The Evidence From the Working-Class Autobiographies of the Eighteenth and Nineteenth Centuries’. Discussion Papers in Economic and Social History. University of Oxford, No. 64 (September 2006).